Jihad Watch : The Iranian people are fed up with the mullahs using their resources to aid jihad terrorists in other lands. They are fed up with the Islamic Republic. We can only hope that they will soon be able to rid themselves of it. 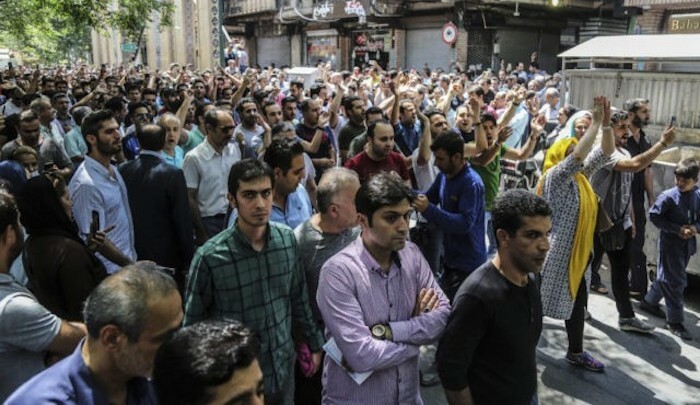 “Iran: Protesters Chant ‘Death to Palestine’ in Tehran’s Grand Bazaar,” by Adelle Nazarian, Breitbart, June 25, 2018 : Thousands of Iranians reportedly took to Tehran’s historic Grand Bazaar on Monday, forcing its shutdown in protest over the Islamic Republic’s decision to spend money on Iran’s adventurism abroad instead of helping fuel its troubled economy at home, where over 40 percent of its population is unemployed. This month, Iranians began posting videos of themselves discarding and destroying regime-run charity donation boxes that they believed were going to Gaza to pay for lavish meals while their own people struggle to offer donations to Gaza….